The College has two main sites in the city centre, the Old Courts on Trinity Street and the Harvey Court site on West Road. All College offices are based in the Old Courts. On arrival at either of the College's sites you should go to the Porters’ Lodge. At the Old Courts this is on Trinity Street by the main entrance to the College. At the Harvey Court site it is a small building close to the vehicle entrance to the site. The Porters' Lodges are manned 24 hours a day. All national bus services currently stop at the main bus station at Drummer Street, about 5 minutes walk to the east of the main city centre College site. Cambridge is on a branch of the East Coast Main Line and is easily accessible from all parts of the country. Train times can be searched for using the National Rail Enquiries website. The railway station is located one kilometre south of the city centre. From there you will need to take either a taxi or a bus to Caius. Buses run roughly every ten minutes and you should ask for a ticket to the city centre. This will drop you in St Andrews Street or the nearby main bus station at Drummer Street, both about 5 minutes walk from the College (see map). There is a frequent train service between Cambridge and London to both King's Cross Station and Liverpool Street Station. The King's Cross service is quicker and takes about 45 minutes. Trains leave roughly every half hour during the day. There is a five or six hour gap between about midnight and about 6 a.m. when no trains run between the two cities. Main routes into Cambridge and the surrounding area are marked on this map. Limited parking is available for visitors at our Harvey Court site. If you are using SatNav, the post code is CB3 9DS. 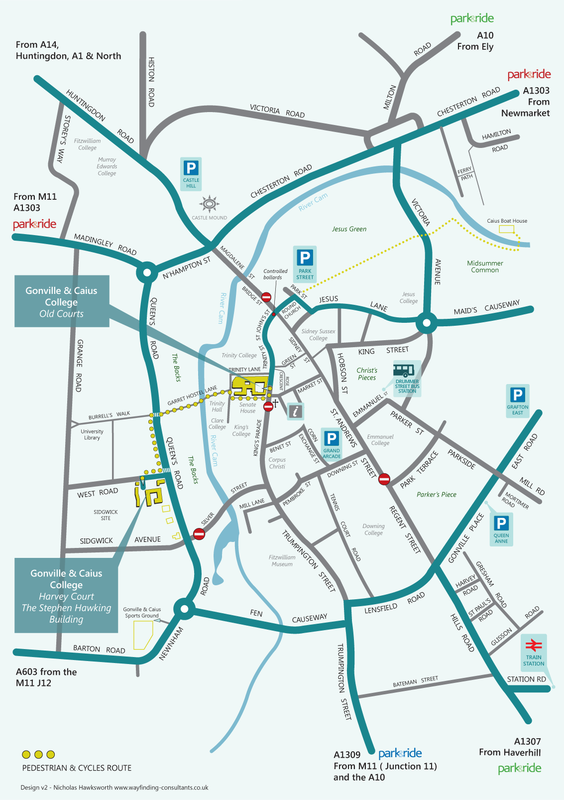 There are a number of car parks in the city centre, but it is often easier to use one of the Park & Ride sites to avoid driving into the city. Of the three main London airports (Heathrow, Gatwick, Stansted), Stansted is by far the most convenient for Cambridge. There is an hourly direct train service to Cambridge during the day and the journey time is about half an hour. There is more than one bus service; try the National Express timetables. If you rent a car then take the M11 North but, if you do so, please be aware that there is very limited car parking at Caius. There is an hourly bus to Cambridge which leaves from stops at both Heathrow Central Bus Station and Terminal 4. Enquire at the airport for stops and bus times, or check the National Express timetables. The journey takes a little over two hours and you arrive at Drummer Street Bus Station, 5 minutes walk from College. It is also possible to travel first to London King's Cross, either by taking the tube (Piccadilly line) or the Heathrow Express to Paddington station and then the tube (Circle line). From King's Cross you can take the train to Cambridge. The Heathrow bus also services Gatwick from where it takes over three hours to get to Cambridge. There are also train services: the easiest and cheapest way is to use the Thameslink service and change at King's Cross. Gatwick to King's Cross takes about 40 minutes and trains are frequent.